NBC News has just confirmed that President Obama will make an appearance at the convention hall tonight. Most speculate that Obama’s there to walk on stage for a sweet photo-op with the man he once accused of racism during the 2008 campaign and now needs to rescue his reelection chances. If you watch the media as I do, and no doubt Obama and his aides do, you couldn’t miss the love fest around Bill Clinton that’s been almost non-stop today. The former two-term President has stratospheric approval ratings and is remembered, even among we Republicans, as a pretty good president who worked with the Gingrich Congress to lower the capital gains tax (which created the jobs boom) and sign the historic and wildly successful 1996 welfare reform act (which Obama has since undermined with an executive order). In order to not look like he’s playing second fiddle to a legend and to a man who unlike him was actually a successful President, it makes sense that Obama would show up to steal the spotlight and make sure that will likely be a commanding performance from Clinton doesn’t completely upstage and diminish him. Obama’s nothing if not petty and competitive, so there’s no way he’s going to give Clinton even one night. Plus, Obama is running a bizarre “back to the future” campaign where he’s trying to thread a very tough needle that only has a chance of success because the entire media-complex is doing everything in its power to protect him. Essentially, Obama has to convince people that he wants to move “Forward!” but also that he deserves to be rehired based on the success of the Clinton economy and not the failure of his. 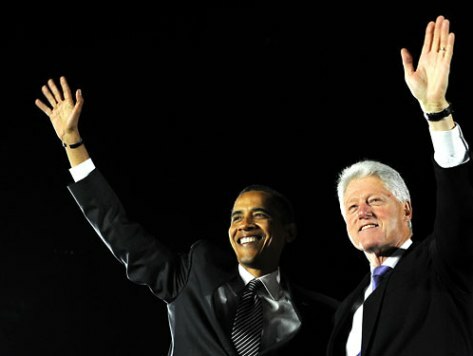 This might be the most bizarre, outlandish, and ridiculous reelection gambit in history, but if it’s going to pay off — if Obama’s going to be able to sell, “Vote for me because Bill Clinton Forward!”, a photo with the former president in all the papers and spread across America’s television screens tomorrow is certainly part of that equation. You know, it’s customary for the nominee to show up early at the convention after his wife’s speech. But Obama is in such desperate shape, he chose to hug Clinton tonight instead. I wonder how Michelle feels about that?